Cover of the October issue of The Smithsonian magazine featuring Lyme-Old Lyme High School alumnus Chris Bugbee and his wife Aletris Neils in a story about tracking the only jaguar living wild in the US. Bugbee is the son of Old Lyme’s Parks and Recreation Director Don Bugbee and the Rev. Rebecca Crosby, Minister for Haitian Outreach at the First Congregational Church of Old Lyme. Chris Bugbee obtained a Bachelor’s degree majoring in Biology at St. Lawrence University and a Master’s degree majoring in Interdisciplinary Ecology at the University of Florida. The Smithsonian piece makes compelling reading and we urge you to take the time to read it. We ran an article on Chris Bugbee and Neils on Feb. 4, 2016, which we are pleased to republish below. It includes a link to a short piece of video showing the elusive jaguar, which is now also featured in The Smithsonian piece. Conservation CATalyst and the Center for Biological Diversity released new video today of the only known wild jaguar currently in the United States. 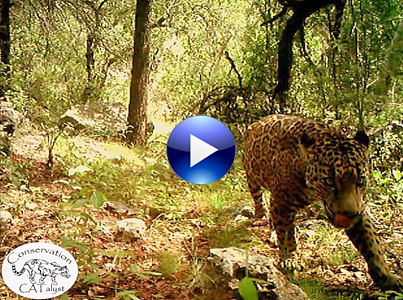 Captured on remote sensor cameras in the Santa Rita Mountains just outside Tucson, the dramatic footage provides a glimpse of the secretive life of one of nature’s most majestic and charismatic creatures. This is the first ever publicly released video of the jaguar, and it comes at a critical point in this cat’s conservation. The camera project is part of ongoing efforts to monitor mountain ranges in southeastern Arizona for endangered jaguar and ocelot. Chris Bugbee, a graduate of Lyme-Old Lyme High School and now a biologist with Conservation CATalyst, has been collecting data on the Santa Rita jaguar for the past three years (formerly through the University of Arizona). “Jaguars have always occurred in Arizona and yet we know so little about them in the northern portion of their range. Arizona should be poised to harbor and protect both jaguars and ocelots as they continue to disperse out from Sonora,” said Bugbee, who now lives in Tucson, Ariz.
Bugbee was featured in an article about the video of the jaguar by William Yardley titled, “He roams alone: El Jefe may be the last wild jaguar in the U.S.” and published in the Los Angeles Times on Wednesday, Feb. 3. El Jefe, as he has come to be known in Tucson, has been photographed repeatedly by remote sensor cameras in the Santa Ritas over the past few years. He is the only verified jaguar in the United States since Macho B was euthanized as a result of capture-related injuries in March 2009. “Jaguars are solitary cats that only tolerate each other for reproduction,” said Neils. But a huge conflict is brewing that threatens to destroy El Jefe’s home. A Canadian mining company is pushing to develop a massive open-pit copper mine right in the middle of the big cat’s territory. The mile-wide open pit and 800-foot-high piles of toxic mine waste would permanently destroy thousands of acres of occupied, federally protected jaguar habitat where this jaguar lives. In October the rare cat was named “El Jefe,” which means “the boss” in Spanish, after a vote by Tucson school kids and others. The Tucson-based Center for Biological Diversity has been working for decades to save jaguars in the United States, with the hope that El Jefe will soon be joined by more jaguars that wander up from Mexico. In 2014 the Center secured more than 750,000 acres of federally protected critical habitat for U.S. jaguar recovery. 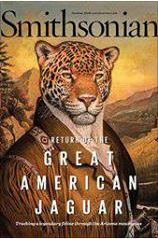 Jaguars — the third-largest cats in the world after tigers and lions — once lived throughout the American Southwest, with historical reports on the South Rim of the Grand Canyon, the mountains of Southern California and as far east as Louisiana. Jaguars disappeared from their U.S. range over the past 150 years, primarily due to habitat loss and historic government predator control programs intended to protect the livestock industry. The last verified female jaguar in the country was shot by a hunter in 1963 in Arizona’s Mogollon Rim. This research builds upon a three-year project (2012- 2015) from the University of Arizona surveying jaguars and ocelots throughout southern Arizona and New Mexico. Editor’s Notes: i) The Center for Biological Diversity is a national, nonprofit conservation organization with more than 990,000 members and online activists dedicated to the protection of endangered species and wild places. ii) Conservation CATalyst is a Tucson-based nonprofit organization specializing in conducting scientific research on cats that are in conflict with people. This is a terrific story. Thank you Chris and Aletris for your efforts to preserve our wildlife heritage.